For months, Russia has been revealing a stable of autonomous weapons—drones, remote controlled tanks, and killer robots—but none have quite captured the world’s attention like their latest poster bot—a humanoid machine that Moscow claims will replace mortal soldiers. 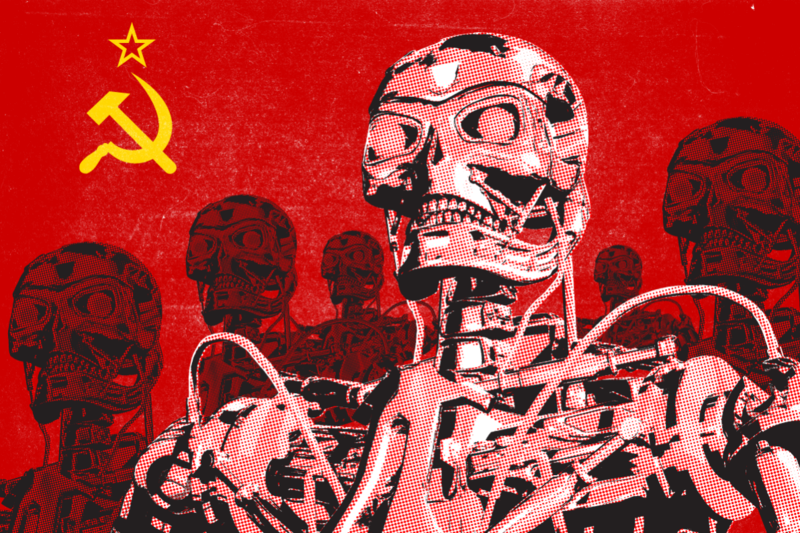 You shouldn’t worry about the device that Russia is calling “Iron Man” and “Ivan the Terminator”—the federation’s military robotics programs is years and billions of dollars behind the United States. Iron Man doesn’t stand a chance against DARPA’s finest, but there is still reason to fear Russia’s future robot mercenaries. Russia’s proto-robo-solider has only been shown in driving simulation with the aid of a remote control suit, but it could someday march into risky areas threatened by explosives, fire, and radiation, according to the Russian paper Komsomolskaya Pravda. The rest of Russia’s robotic lineup is much more useful and much less like Isaac Asimov characters. For instance, the Uran-6 is a remote controlled land mine detonator and the Uran-14 is a tank that puts out fires with a scorpion-tail-like water blaster. Russia is also working on robots that kill, like Uran-9, which fires 400 rounds per minute as well as guided missiles and Platform-M, which rolls around next to soldiers, firing ammunition like a souped-up R2-D2. With these new developments, Russia joins the United States and China in the club of world superpowers trying to build autonomous soldiers. But does that mean we’re in the throes of a robotic arms race? Not according to Peter W. Singer, an expert on emerging military technology and senior fellow at New America think tank. Singer says robotic weaponry is already far too ubiquitous for the tech to be at the heart of a battle for military supremacy. Perhaps Russia is just readying for the machine-covered battlefield of tomorrow—or maybe Vladimir Putin wants to have the same technology-enabled deniability that the U.S. has had for more than a decade.
. The rest of Russia’s robotic lineup is much more useful and much less like Isaac Asimov characters. For instance, the Uran-6 is a remote controlled land mine detonator and the Uran-14 is a tank that puts out fires with a scorpion-tail-like water blaster.